Prof. Dr. Gelengül Haktanır, Executive Committee Chair of the above association had come into contact with Storyline through the interest of her PhD student Sule Tepetas. While an Erasmus scholar working in teaching practice in Halmstad, Sweden, Sule had observed Storyline in action. She was attracted to the approach and decided to use it in her research study. 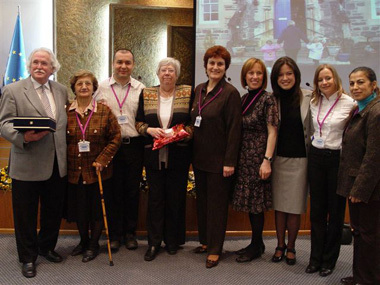 It was for this reason that Prof. Haktanir wrote to invite Sallie Harkness and Steve Bell of Storyline Scotland to be keynote speakers at the Spring Conference of the Association. 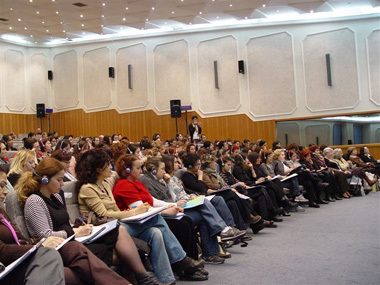 The event was held in the magnificent lecture theatre in Ankara University and was followed by two workshop courses which lasted for the rest of the day. Simultaneous translation helped the presenters enormously during their lectures and these same interpreters continued to assist the tutors during the workshops. A team of organizers led by Dr Arif Yilmaz had prepared the workshops so effectively that it made it very easy for Sallie and Steve and the participants were enthusiastic in their response. Although this was a first Storyline visit to Ankara it is hoped the links will continue and develop. Many thanks are due to all those involved.